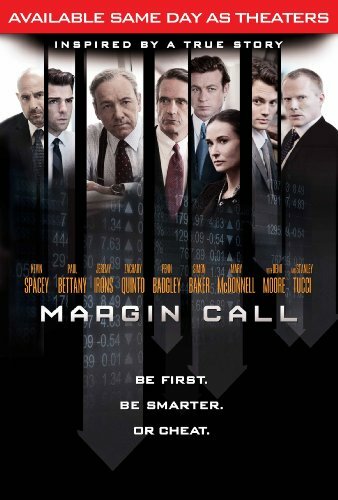 Margin Call is a taut, intelligent, crisp story of one NY investment house which realizes (credibly, at least for movie purposes) that the economic crash/conflagration of 2008 is not only going to happen, but it is happening, however subtly. As a result, we get to see the reaction of and impact upon the Gekko like Jeremy Irons; the execs who sold him on the mortgage-based investment policy that has brought the firm to the brink of ruin (a harsh looking Demi Moore, made all the more brittle by her counterpart, the Dorian Grayish Simon Baker); the traders (Kevin Spacey, who I would say steals this movie except for the fact that Paul Bettany as his no. 2 is every bit as good and everyone else is excellent); and the lower-level risk analysts (Stanley Tucci, Zachary Quinto and Penn Badgley, who I last saw in a crappy remake of The Stepfather and who shines as his devil-may-care bravado crumbles during the crisis). The film never misses a beat as it propels the story (which unfolds in a 24 hour period) while offering great characters in an ensemble piece, loaded with dialogue that is thoughtful and funny. By far the best film of 2011.